HEAT oven to 350ºF. Reserve 1 tsp. sugar. Mix remaining sugar with pudding mix. Combine fruit in large microwaveable bowl. Microwave on HIGH 1 min. Stir in pudding mixture and water. SPOON into 8-inch sq. baking dish. Mix baking mix and milk. 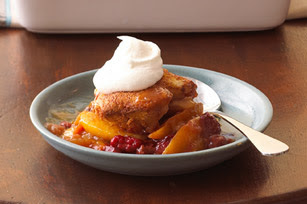 Drop in mounds over fruit mixture. Mix reserved sugar and cinnamon; sprinkle over dough. BAKE 35 to 40 min. 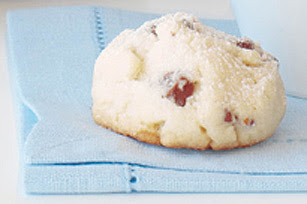 or until fruit mixture is hot and bubbly and biscuits are lightly browned. 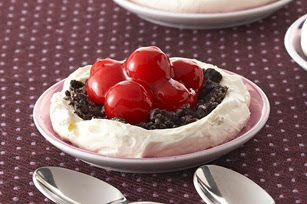 Serve warm topped with whipped cream. 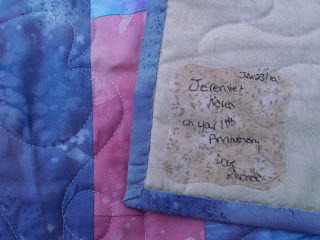 And Therese has a story for this quilt. She had been working on it than went out. When she came home, she smelled a funny smell. 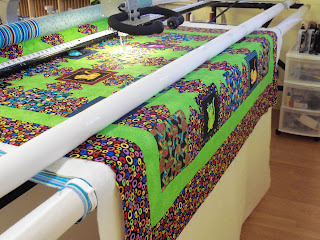 The quilt had fallen off her sewing table and landed on an electric baseboard heater. 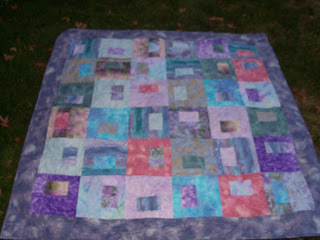 The entire center of the quilt was scorched. With no extra fabrics on hand, Therese appliqued the flower to the quilt to cover up the scorch marks. I should have taken a picture of it from the back; they were really quite bad. Thank you for all your kind comments on the loss of Abby. 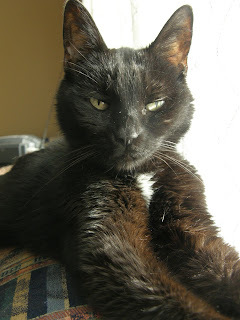 We knew it would be soon; she would have been 17 this fall. She was apart of our family for 13 years and was greatly loved. That's what I felt like yesterday. 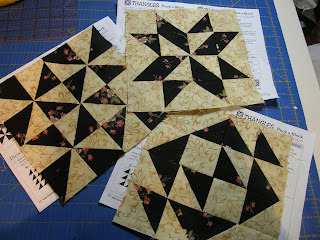 Even with yesterdays drama I still managed to complete some quilting projects. Or get them to the quilting stage. 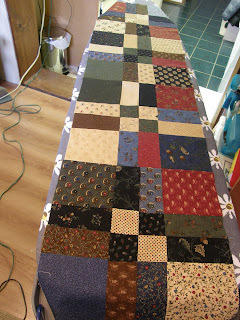 First, I got my disappearing 9patch table runner together. I've decided to not go with a border. I'm really pleased with how this has turned out. 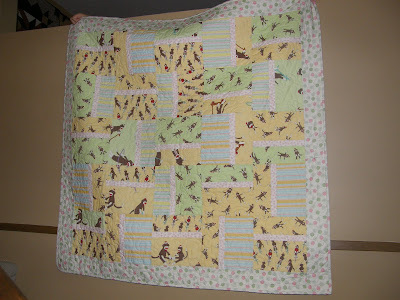 Next, I finally got my doll quilt quilted. This wasn't meant to be a doll quilt. In fact, I'm not ever sure if it qualifies for a doll quilt, I'm just calling it that. 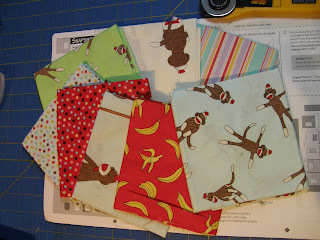 I bought a scrap bag of fabric and had originally planned on putting the strips into a baby quilt backing. 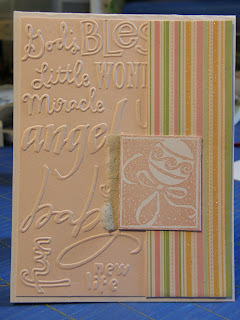 Instead, I cut the strips in half(there is another piece like this) and added the two little borders. 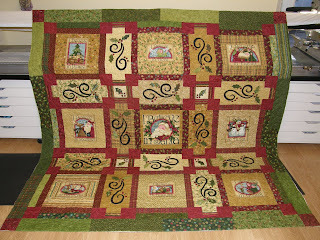 Than I quilted it. 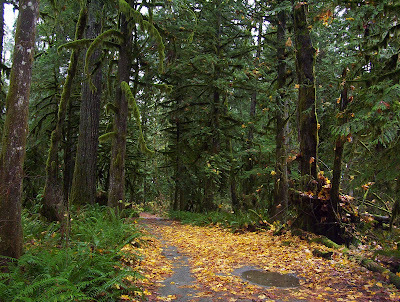 I did it on my domestic machine and did a loopy meander. Dare I say that this little quiltie took me roughly 3 hours to quilt? Yes THREE hours! 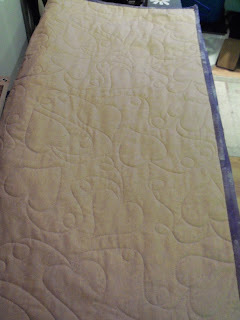 The quilting is no where near perfect; some of my loops look very square lol. But for a first time, I think I did good. I maybe should have used white thread instead of gray on the back though lol. Next up? The last of the sock monkeys. There's been another baby born! I think this is the 3rd time this is happened in the past few months lol. 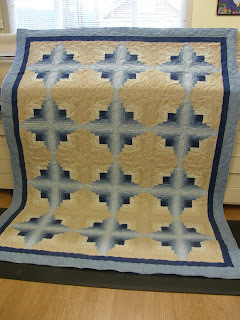 And yes, there was just enough thread to finish the quilt! *whew*!! Three in one day? wow lol! I have to share what happened today. Today was the fourth week back to school since the Christmas holidays. Every Monday since, we have had one kid home sick. I wasn't feeling well last night so I had decided to stay home today and just relax. I had just gotten home from dropping off B and M when I got an email from M's teacher. She was outside when B hopped over a chain blocking the pathway and he tripped. He ended up falling face first into the pavement. Surprisingly he wasn't bleeding but his lip was swelling pretty good. She gave him an ice pack and than sent me an email letting me know. I was just replying to her when the phone rang. It was B wanting to come home because he hurt. So back to school I went. The office seemed surprised to see me; B was back in his class but I wanted to check on him just in case. I thought with him back in class, maybe he was okay. I get to his classroom and his teacher was so happy to see me. She's going on how he needs to see a dentist right away; that she had sent him out to look for the missing part of his tooth but he couldn't find it. Um, what am I missing? Turns out B was the one missing something. 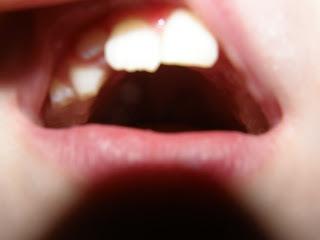 A good chunk of his front left tooth. His adult front left tooth. The picture doesn't show how bad it was( I really should have grabbed my camera and not just my cell phone lol) The split/crack actually went almost up to his gum. And of course our dentist isn't open Mondays. Thankfully he is apart of a larger dental office and we were able to get into another dentist as soon as we could get there. I raced home and grabbed Jim and off we went. After some xrays, they applied some freezing gel(that B promptly said tasted like slug lol) and we started waiting. Every once in awhile the hygenist would come and see how much feeling he had left. Than it was time for this. Now I DO NOT do needles. Needles and blood are pretty much on the same level for me. 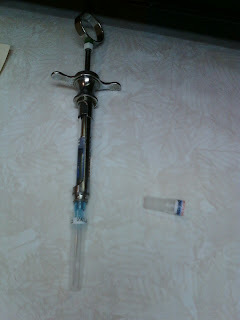 I had all but one of my baby teeth pulled when I was a kid; I know how much these needles hurt! The dentist had that needle in and out so quick! I told B when the dentist finished that he had just had a big needle in his mouth. He didn't believe me until I showed him. The look on his face when he saw how big it was; priceless lol! Freezing kicked in pretty quick and we were literally out of there in under 15 minutes after that and home by 11:30. The dentist is fairly confident that there wasn't any nerve damage and that the tooth shouldn't die. Fingers crossed. 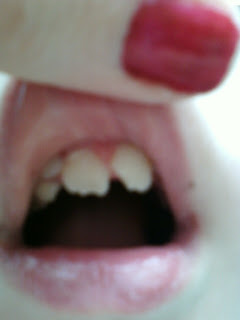 Here's a really bad picture of the *new* tooth. B was pretty excited that he got to spend the day at home and not at school lol. And Jim and I are pretty excited for extended dental coverage! It's been a while since Bag Ladies had all gotten together. This time we descended on Marcia's. 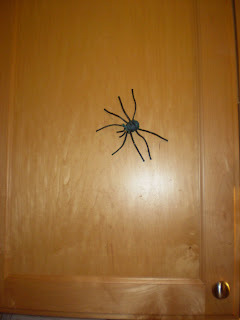 I'll admit the (fake) spider in Maria's kitchen got my heart pumping pretty good. Not what I was expecting to see lol. 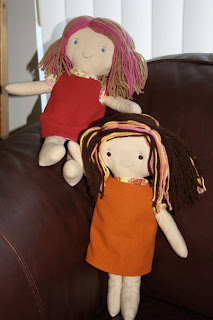 Marcia made the cutest dolls for her girls for Christmas. 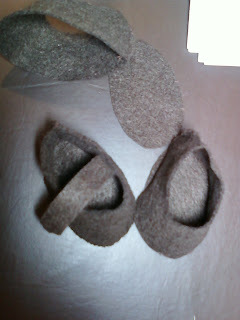 Tonight Marcia was making little shoes for them. 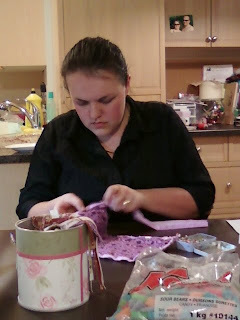 Sarah working hard on another messenger bag. I didn't get a picture of the finished product sadly. It is so cute! Andrea started cutting out a beautiful flannel quilt. For some reason I don't have a picture of her working hard. All I've got is this lol! Cindy and I decided to work on our Thangles blocks. I was very happy to see that I only had 3 more blocks to finish. 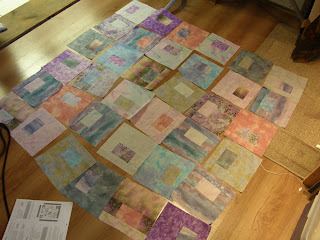 Now to start assembling the quilt! 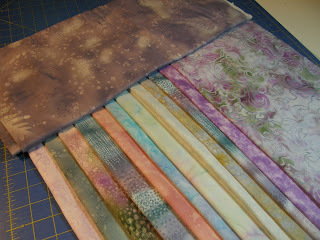 Once I got those finished, I made some 9patch blocks for a table runner giftie I've been asked to make. 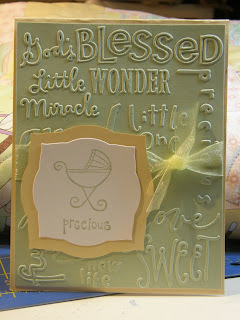 Love the Wildflower Serenade line. Again, it was another fun Bag Ladies night. Even if a lot bags weren't created this time around lol. Can't wait until the next one. I'm going to start off by saying how upset I am with these pictures. It was raining at the time I took them and all the batteries for my cameras were being recharged so I had to use our oldest's camera. Quilted with Timeless Hearts. LOVE this pattern. And it's currently on sale!! I even smacked a label on. Go me! BEAT butter and super-fine sugar in large bowl with mixer on high speed until light and fluffy. Mix flour and cornstarch. Gradually add to butter mixture, beating well after each addition. Stir in chocolate. BAKE 20 to 25 min. or until lightly browned. Cool 5 min. on baking sheets. Transfer to wire racks; cool completely. Sprinkle with icing sugar. I may have to add this one on my list for this year. Love this kit. 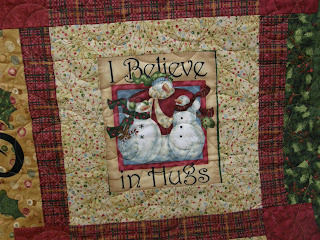 For Hamels Quilt Store. This fabric is my favorite. And the snowmen?? Perfect! It's a good thing I didn't see this in December lol. Look! 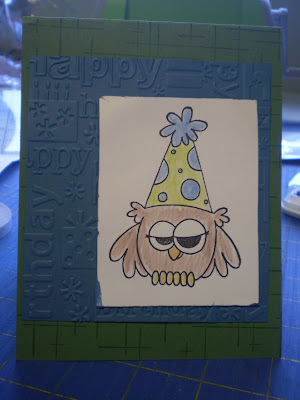 A kid's card with NO PENGUIN! Wednesday was a bizarre day; too much coming home than having to leave again. I spent most of the morning on the phone trying to find info on our sponsor kids in Haiti. Was told it will be up to a month before we know anything for sure. We do have faith they are okay since they live north of Port au Prince but still, we want 100% confirmation. While I was making those phone calls, we had an appliance repair man here. And our dryer is officially dead. UGH. In the afternoon we headed over to a local scratch and dent place and got a new one. Who cares that it's got a dent or two? The price was right! The best part of yesterday was the monthly meeting of Ladies who Lunch at our favoritest restaurant. Love these ladies! I did take my camera but never took it out of my purse. That may be a first for me! 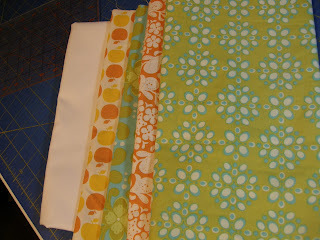 Last night I spent finally getting my secret quiltie put together. 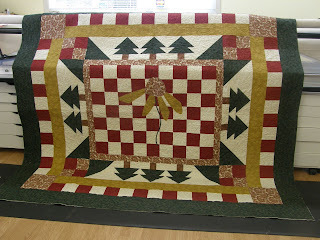 I'm just noticing now that this picture is not the way the quilt went together. Hmmmm lol. I'm not 100% thrilled with this quilt. 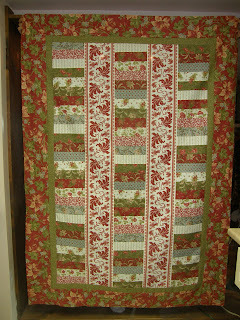 It's made from fat quarters and some of the fat quarters I had purchased, the fabric was a variegated fabric. I didn't realize that until I opened them up. 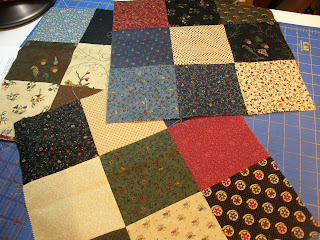 So when I sewed the blocks back together, I tried to still go with the variation in the fabrics so it was continuous. That was a bit of a challenge in some cases lol. 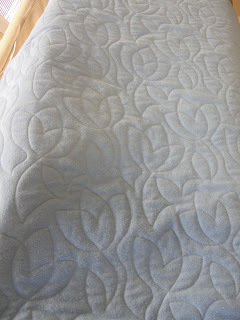 Now I'm off to work to get it quilted. Have a good one! 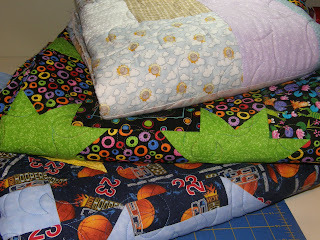 Instead, I'll show you two customer quilts I did last week. Both are for Donna. 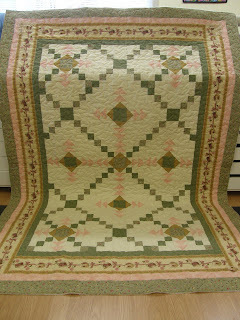 I simply adore log cabin quilts and I don't own one of my own. Every year I say I will make one. 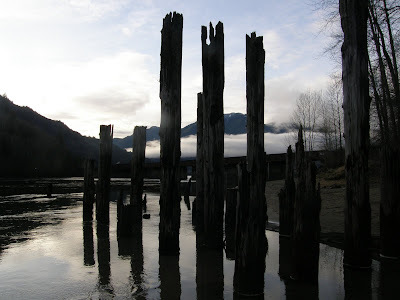 I love how the blue logs in this one are smaller. So pretty and striking. I love how the pattern shows up on the back. MICROWAVE cream cheese spread in medium microwaveable bowl on HIGH 10 sec. or until softened. Add whipped topping; whisk until well blended. SPOON cream cheese mixture onto 4 dessert plates. Use back of large spoon to shape each mound into shell. SPRINKLE insides of shells with crumbs; fill with pie filling. Had such a fabulous day! So great that I am just getting on here now at 10pm to post for today lol. Started off meeting a friend this morning at my favoritest restaurant. Nothing beats a rainy Friday morning than a great cup of tea and conversation with a wonderful friend. 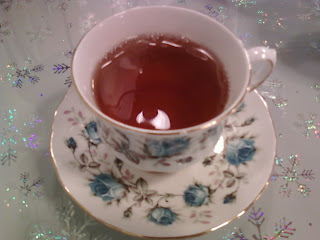 Buckingham Palace tea; oh so yummy. 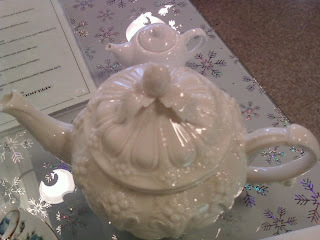 And the teapots, I love them all! I hadn't seen the one before that I got today. Lovely! Than it was off to school. Today was my day to help out with lunch supervision. I was very happy to have today as an *indoor day* since it was so very wet outside. 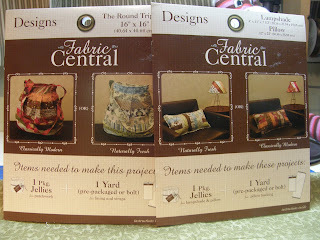 After, Mom and I went to Hamels Fabrics. I have signed up for Rachel's Modern Siggy Swap. I knew which fabrics I wanted and to my happiness, they were on sale! Mom and I have both doing Rachel's Pinwheel Sampler. I went with Portebello Market for this one. Can't wait to get started on it. 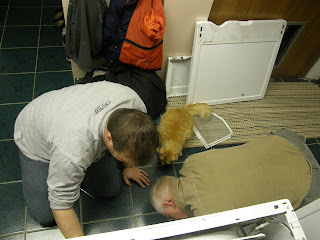 When we got back to my place, I was thrilled to discover Dad and Jim working away on our dead dryer. I am thrilled to report that it is now working-yay! Even Gizmo got in on the diagnosing of the problem lol. So now, Card Friday. I may have shown this card before. If so, please forgive me! And the winner of my giveaway is, Judy from My Front Porch! Thanx for entering everyone! Just because. Winner gets both these brand-new patterns. One for a bag and one for a pillow. All you need to do is tell me what movie you are looking forward to most this year. As many of you may think mine is Eclipse, the third in the Twilight Saga. It's not. A very very close second to Toy Story 3; can not wait for that! So, tell me what your most awaited movie of this year is and I'll announce the winner on Friday. Good luck! Monday we discovered the roof is leaking. Yesterday the front brakes in the van went. And today, my dryer died. Dead beyond dead died. Good news? Jim can patch the roof; it's not a horrible leak so it's not that worrisome. Yet. We had the money to fix the brakes but now the emergency fund is empty. And my dad and Jim are fairly confident that between the two of them, they can repair the dryer. With all that and spending much of my day glued to CNN to watch the horrific pictures from Haiti(we have family friends that were missionaries there for 23yrs. 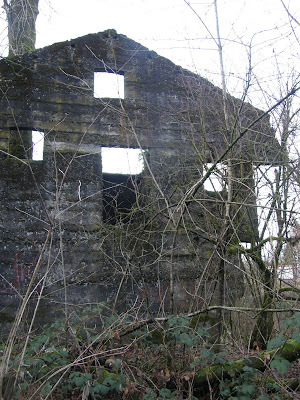 my dad has visited the country and we currently have sponsor children there) not much got accomplished today. What I did accomplish? I finally got the borders on my New Year's Eve quilt. It's the Roman Holiday line from Moda. 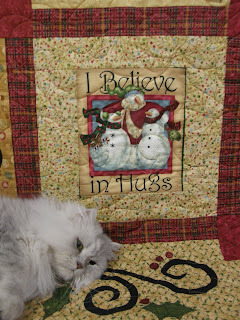 I got this quilt for Christmas I believe it was 2007; it may even have been 2006 lol. 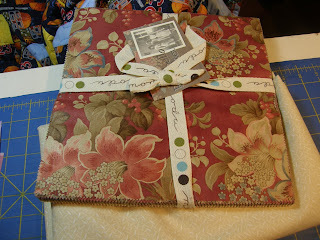 Ever since I did a customer's Roman Holiday quilt, I've been itching to get mine done. And here it is. 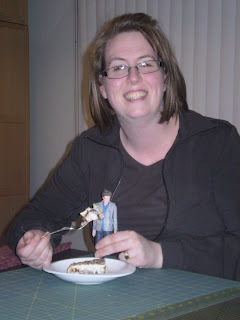 I made mine bigger(what else is new lol). 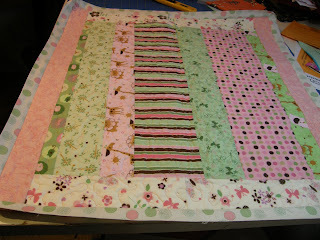 I also had enough strips left over to make a section to put into the backing. At first I thought this could go on the wall but it's a little large so it will look lovely draped on my new favorite chair. 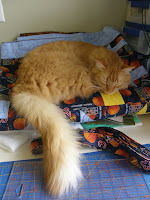 And just because he is so cute and literally spent all day on my sewing table, Gizmo. There has been a baby boom at our church recently. 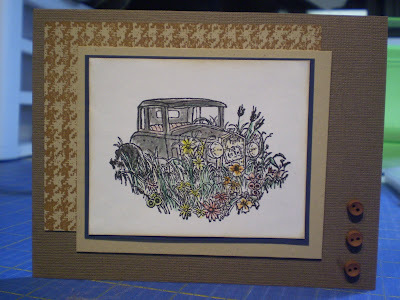 I made this card to go with this quilt. I didn't mean to make them match but liked how they did. 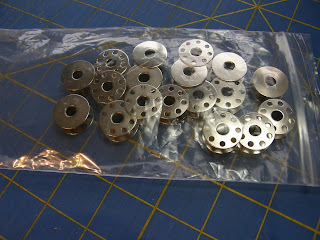 After my mad dash to complete my Christmas quilting projects, I ended up with 15 bobbins emptied. 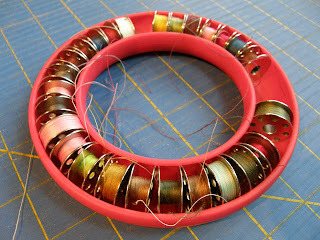 That's an awful lot of thread! My first finish for 2010! And now to start a super special secret project.